CHANNEL ISLANDS — June Gloom did not dampen the spirits of 50 disabled veterans who enjoyed a day at sea. The group represented all branches of the United States military at an event sponsored by Anacapa Yacht Club Sunday, June 14. “It was a bit of luck the way the calendar worked out for this event to fall on Flag Day,” Anacapa YC Commodore Tina Roberson said. Event Chair Randy Alcorn, a Marine Corps vet, and Anacapa YC member Mike Taylor coordinated the 19 boats and skippers needed to accommodate the veterans. Seabee volunteers from Ventura County Naval Base helped with the event and went out on boats to assist. 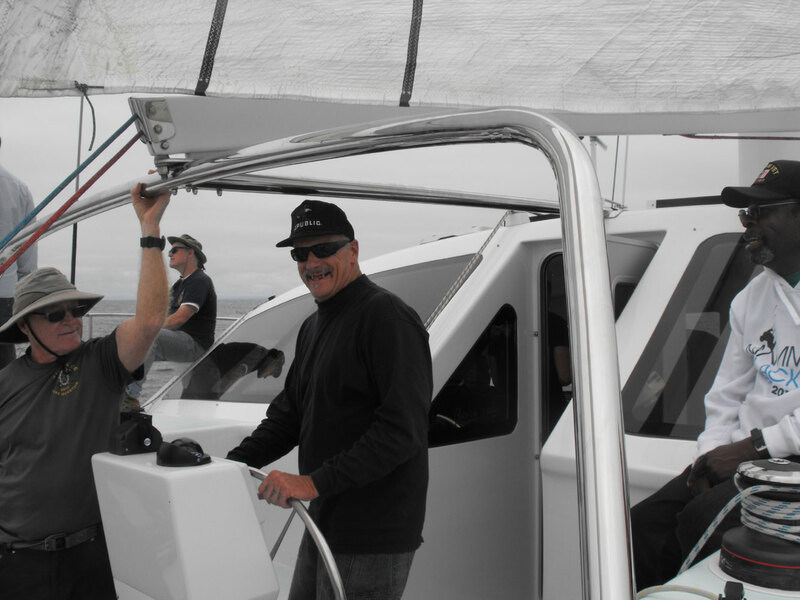 “Skippers who volunteered their boats for the day were from Anacapa YC, Pierpont Bay, Channel Islands and Fairwind yacht clubs along with local dock mates. It’s great that so many people want to help. Many of them are veterans too,” Roberson said. Army vet Chan McKearn took six vets out on his Chris White designed 47-foot catamaran Escape. These men served in many areas of the world including, Iraq, Afghanistan and Vietnam. Kevin Ortiz, an Army veteran, grew up in New York and recalls happy times fishing around Martha’s Vineyard. “I love being on the ocean. It gives me a sense of freedom. This is my first time on the water since I was 18,” he said. Michael Thomas, a U.S. Coast Guard vet, enjoyed his chance at the helm, saying, “I was stationed here in Oxnard. We would go out on patrol in the channel and out to the islands. This is a great way to spend the day,” he said. Army vet Isaac Calhoun loved being on the helm, especially when he got to tack the boat. “It’s not as easy as it looks,” he said. At the clubhouse, Anacapa YC member and disabled Seabee vet Chris Williams coordinated the food with the help of active duty Seabees. Music duo The Upperhand played at no cost. Thousand Oaks Elks Lodge #2477 again provided support for the event; Bayside Construction and Ventura Harbor Boatyard donated funds, as did several Anacapa YC members to cover event costs.